Flip Trainer Shell in discontinued colors. Flip Potty Trainer Shell Only. Made in USA. One-size fits most from about 20 pounds and up, fits better on average to fuller, rounder shapes. This the shell (cover part) only. Absorbency is not included. 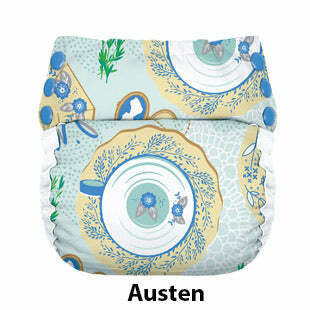 Use your own cotton insert, prefold or flat diaper inside the shell (cover). See the regular stock Flip Trainer Shells. Shell only. 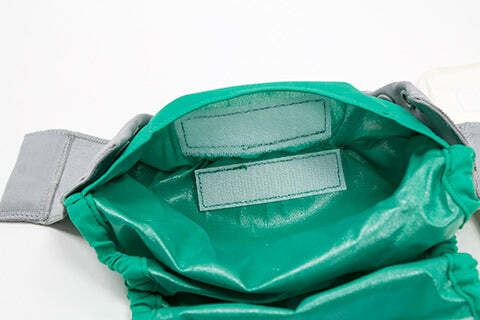 This is the waterproof outer part. Absorbency is not included. Stretchy sides for pulling up and down. Snaps at the side for just in case you need to unsnap it. the snap positions are adjustable for a good fit on a very large size range of ages of potty learners. Ribbit is not a sale color, but this picture shows the stretchy sides with the snap adjustments. The full Kit is sold here. All Bum Genius and Flip products can ship to USA addresses only. Manufactured by Cotton Babies.